In July, the OAS Secretary General, Luis Almagro, designated Moreno Ocampo as Special Adviser, and as such, Moreno Ocampo is tasked with analyzing, studying, and debating the ongoing situation in Venezuela with interested parties to determine whether the State committed crimes against humanity and can be referred to the ICC. [OAS Press Release: Adviser] Accordingly, the sessions were held to examine whether the abuses by the Venezuelan government rise to the level of crimes against humanity and if they were committed in a widespread and systematic manner. [OAS Press Release: First Session; OAS Press Release: Second Session; Moreno Ocampo] The testimony gathered in the sessions will contribute to a final report, along with information submitted by additional organizations; the Independent Panel of International Experts, appointed by the OAS Secretary General in September, will review the report and recommend it to the Secretary General. [OAS Press Release: Independent Panel] This is the first time that the regional body has held sessions with the purpose of referring a Member State to the ICC. 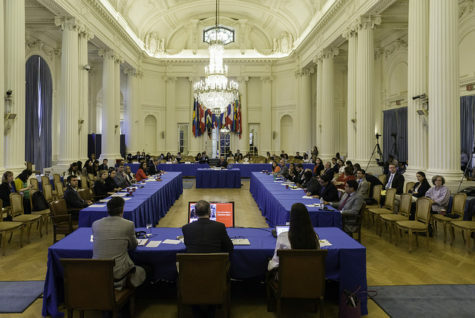 At the first round of sessions, which was held on September 13 and 14, the OAS Member States and observers heard from Julio Henriquez of Foro Penal Venezolano; Francisco Márquez Lara of Visión Democrática; Tamara Suju, a criminal lawyer and Executive Director of the Center for Latin American Studies; Johanna Aguirre, a human rights activist and victim; and former members of the Bolivarian National Armed Forces. The statements focused on State policies of repression, systematic political persecution and intimidation, torture of political prisoners, and the use of generic charges to prosecute civilians in military court. OAS Press Release: First Session] See OAS, Sessions to Consider the Situation in Venezuela Facilitated by Luis Moreno Ocampo, Special Advisor on Crimes Against Humanity of the Secretary General of the Organization of American States, Summary of the Session of September 14, 2017 (2017); OAS, Sessions to Analyse the Situation in Venezuela Facilitated by Luis Moreno Ocampo, Special Advisor on Crimes Against Humanity of the Secretary General of the Organization of American States, Summary of the Session of September 15, 2017 (2017). The second round of sessions was held on October 16 and 17. [OAS Press Release: Second Session] In the October sessions, the witnesses were two family members of victims – Doris Coello, mother of Marcos Coello, and Rosa Orozco, the mother of Geraldine Moreno and representative of Justicia, Encuentro y Perdón – a representative of the NGO Voluntad Popular, and individuals who had previously served in the government or who continued to serve in exile. Judge Ralenis Tovar, former judge of the Metropolitan Area of Caracas; Pedro Troconis, President of the Criminal Bench, Supreme Court of Justice of Venezuela in Exile; Armando Daniel Armas, Deputy, National Assembly of Venezuela; Isaías Medina, former Minister Counselor, Permanent Mission of Venezuela to the United Nations; Walter Marquez, former Deputy of the National Assembly of Venezuela; and two mayors contributed testimony. The October sessions focused on the weakening of the independence of the judiciary; the failure to address the humanitarian crisis in the State; the outlawed government of Venezuela; the imposition of military rule on civilian courts; the illegal use of arbitrary detention, isolation, torture, and cruel, inhuman, and degrading treatment; the removal of opposition party mayors from office; the threatening of dissidents; the forced mass relocation and deportation; and violence against and killing of civilians. See generally OAS, Second round of meetings to examine whether the situation in Venezuela warrants being submitted to the International Criminal Court, October 16, 2017 (2017); OAS, Second round of meetings to examine whether the situation in Venezuela warrants being submitted to the International Criminal Court, October 17, 2017 (2017). Venezuela has been undergoing a move towards authoritarian government under the rule of President Nicolás Maduro, leading to escalating tensions, a declining economy, and significant food and good shortages. [IJRC: Food] Following a series of protests related to the food shortages and failing economy, in 2016 President Maduro instituted a state of emergency greatly restricting the rights of Venezuelan people. [IJRC: Food] The state of emergency has been renewed four times, and protests by political opposition parties and protests related to the declining conditions in the country have been violently suppressed. Amnesty International, Amnesty International Report 2016/17: The State of the World’s Human Rights (2017), 393-97. The ICC was inaugurated in 2002 and has its seat in The Hague, Netherlands. The ICC tries individuals for war crimes, genocide, and crimes against humanity. The Court has jurisdiction over cases in which the alleged perpetrator is a national of one of the 124 States parties to the Rome Statute, the crime was committed on the territory of a State party, the State involved authorizes the Court’s jurisdiction, or the United Nations Security Council refers a situation to the Court. The ICC is an international tribunal designed to complement national judiciaries; thus, it can only step in when national courts are unable or unwilling to prosecute. Venezuela ratified the Rome Statute in 2000. If the OAS refers the case to the ICC, it will be the first case reviewed on the basis of a regional organization referring a situation to the ICC. Venezuela would be the first ICC case referred by the OAS, and the first case in the Americas to be investigated. For more information about the International Criminal Court; international criminal law; or the ongoing situation in Venezuela, visit IJRC’s Online Resource Hub. To stay up-to-date on international human rights law news, visit IJRC’s News Room or subscribe to the IJRC Daily.